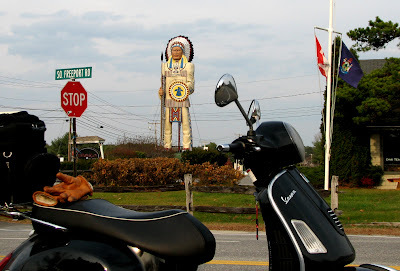 Scooter by the Sea: Final Warm Weather Ride? 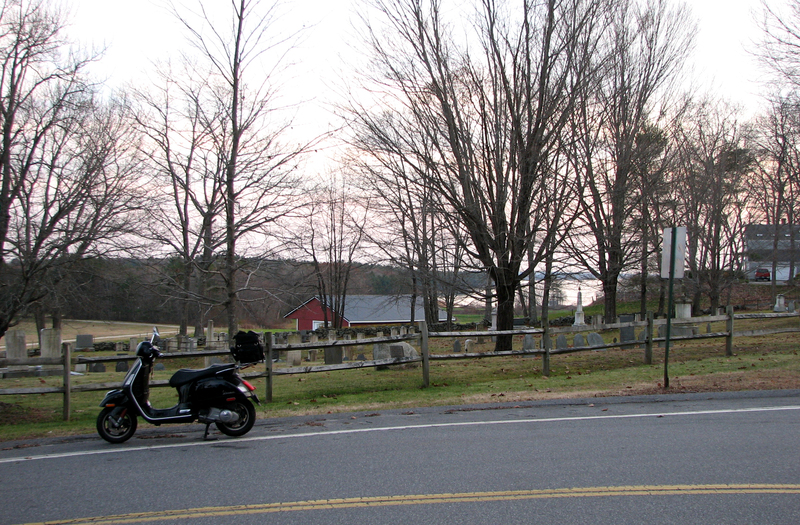 With all signs pointing to the onset of typical Maine winter chilliness, Sunday's 65 degree weather, even though tempered by overcast skies, led me to believe that this would be the last time I could ride 80-plus miles without my ski-mobile suit. 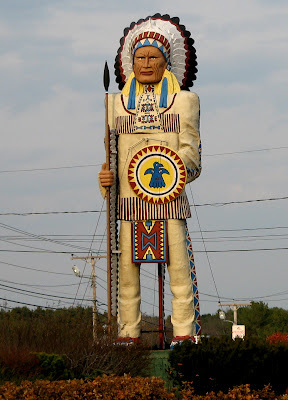 My first stop was at the Maine Big Native American (MBNA, in current politically correct terms). Created by Ron Shutt in 1969, Mainers usually call it the "F.B.I." for Freeport Big Indian. One does not need much imagination, nor a particularly dirty mind, to find a suitable substitute for "Freeport" in the acronym. At about 50 feet in height, the Indian is indeed fabulously, fantastically, formidably tall. Stuck for a substitute beginning with "F?" Find a sailor, cook, mechanic, or Joe Biden, show him the picture of the F.B.I. and you'll have the answer. With all the trees lacking leaves, it's easier to see the ocean. 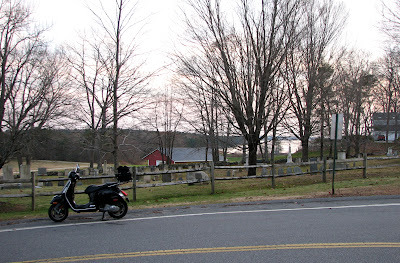 During the summer, one can ride right next to the sea without seeing a wave; Maine is the most heavily forested state in the nation, and a whole lot of the Atlantic is hidden from view when the trees are in bloom. In his poem "Mending Walls," Robert Frost said that "Good fences make good neighbors." 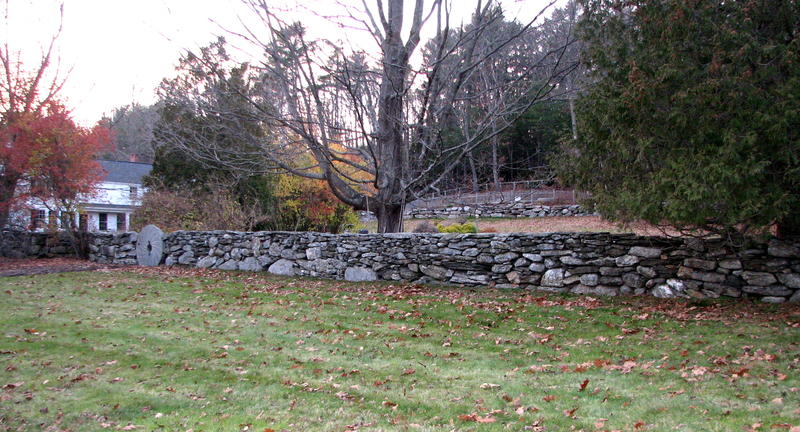 He might have added that stone walls are endlessly interesting to examine. This one in Freeport is truly magnificent, and its gate is unique. 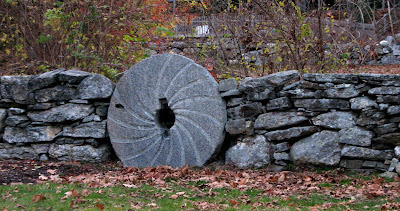 I've seen many stone walls, but this is the first one I've seen with a mill stone for a gate.